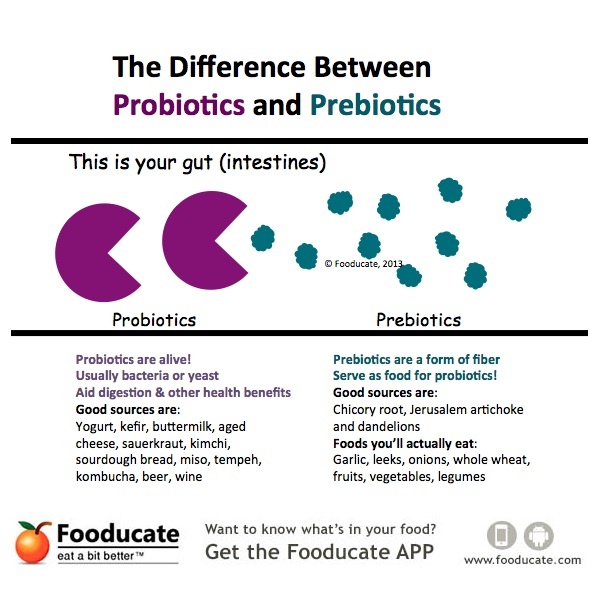 There is a lot of hoopla out about probiotics and prebiotics. We know they’re in yogurt. There’s even a brand of yogurt that actively touts their probiotics (Activia). So what’s the deal, why are probiotics so important? And what the heck is a prebiotic? How are they related? Probiotics (meaning “for life”) are the opposite of antibiotics (“against life”). Our gut is naturally supposed to have a variety of Lactobacillus bacteria in it. These good bacteria help with a myriad of things, from immune health to digestive health. They also help with urogenital health. “Prebiotics are non-digestible food ingredients that stimulate the growth and/or activity of bacteria in the digestive system in ways claimed to be beneficial to health. ” (http://en.wikipedia.org/wiki/Prebiotic_(nutrition)) Prebiotics are therefore necessary to feed probiotics and maintain proper intestinal/urogenital flora. This is an area that hits close to home for me, and perhaps many women, and is often not addressed or at the very least under-addressed. We know that the gut, and for women the vaginal tract is a very finely balanced system. So many things can “throw it off” and cause a yeast infection or Bacterial Vaginosis (BV) and make for an extremely uncomfortable time. BV can also cause pre-term labor (1). My daughter was born 10 weeks early, with no real explanation, as I had a textbook pregnancy up until my water broke 11 weeks early. I have struggled with BV for years, and it was only recently (a year after my daughter’s birth) that I asked for a test to see what is going on and why I’m continually dealing with this. It turns out that I have a lack of Lactobacillus, or good bacteria. So it was recommended that I take a probiotic daily. Scientific proof of probiotic supplementation effectiveness is still being investigated, but the few studies that have been conductive show that there may be benefits, and there generally is no harm in taking a daily probiotic (2). This is also one of the many, many, many reasons why I drink Shakeology daily. It has both pre- and probiotics to help with digestion and immune support. I do take a different strain for feminine health, and I can that all the good nutrition and pre- and probiotics in Shakeology have made a tremendous positive impact on my overall health.